I just saw a feature on Google work facilities all over the world (but mainly the big one in California). They test colors to see how they affect the workers' productivity. Purple was rejected, and soon a large, freestanding wall will be repainted a different color. Purple flowers in the garden are another matter. I love them. The darker the better. I remember coming across this combination in Margaret Moseley's garden, and I was blown away by the contrast between foliage and flower - not exactly the same hue, but stunning, nevertheless. My late husband's favorite color was purple. Not that he ever wore any purple that I can think of, but I do know, according to his mother, that all his birthday cakes growing up were purple. This fact inspired me to make a cake for him from scratch for his 39th birthday. Some background: My mother was one of the best cake bakers in my home town, which is saying a lot. We used to have these things called cakewalks, where people would walk around a chalk circle and land on a number when the music stopped (I think this is how it worked). I can't remember if they were forced to take the cake with the corresponding number or whether they got to choose if they landed on a high number or what. At any rate, my mother's cakes were always the most sought after. Until I was 37, I had never baked a cake from scratch. So, I assumed that if I could read, I could come up with a purple cake for my husband's birthday. My older daughter, who was six at the time, was thrilled with the idea. First, I had to buy cake pans. And then, I bought Swans Down cake flour, like my mother used. Somewhere along the way, something happened, and the cake broke apart after it was assembled. Still, the icing made up nicely. But, as I tried to direct my daughter to mix red and blue food coloring for purple, she decided instead to make a rainbow cake. The result was a color I'd never seen, something resembling a cross between mud and algae, but with what looked like swirls of Gulden's mustard. All this glopped on a broken down stack of crumbling layers. My husband came home and was a good sport about eating the cake that was supposed to be purple. Sad to say, soon after he consumed a large piece, he became very sick. I am sure it was from the hideous color. I have never baked a cake since. But back to the photograph. This has to be one of my favorite combinations ever by Margaret Moseley. 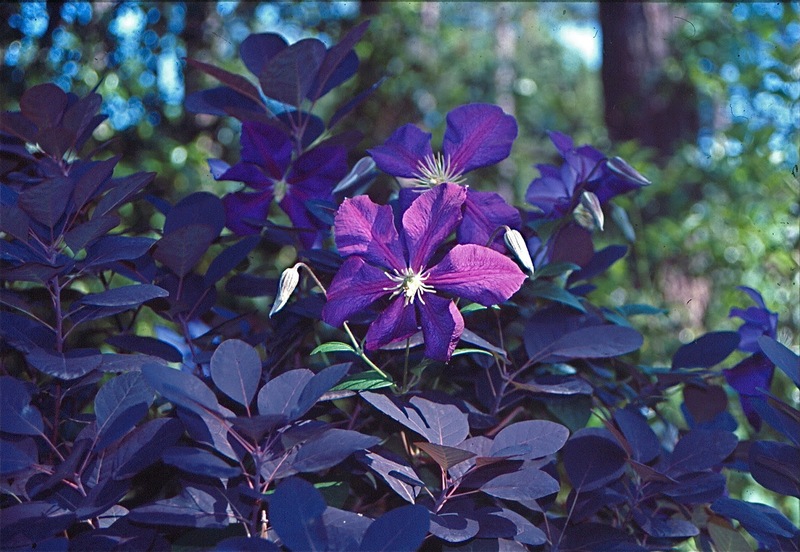 She often plants clematis to grow up into a shrub or tree. 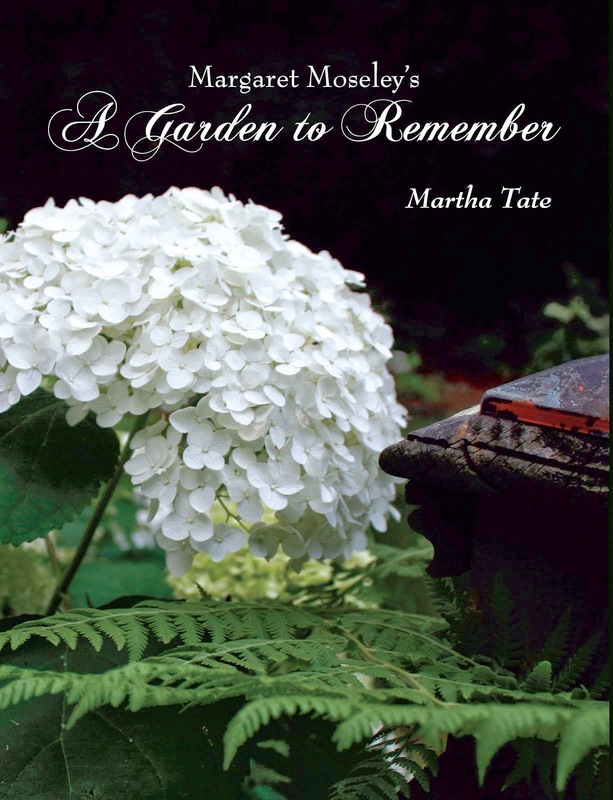 In this case, she chose Clematis jackmanii to grow up through a purple smoke tree. In areas where nights are cooler, the purple form of smoke tree retains its color longer (it fades to greenish purple in summer here). To achieve vivid color for the new growth, you can prune the branches back in late winter/early spring. It seems this would work well with Clematis jackmanii, which can also be pruned at the same time. Even if the branches fade to green later on, it's worth a month of vivid purple in the spring. So, maybe a purple wall doesn't work inside Google headquarters, but I believe this particular combination would work in their garden. I can't imagine not being inspired by such beauty.